“HARD ART VS. SOFT ART: the manifesto!” ­­ – S.A.M. “Punk plunk dunk worldwide reporting with full-force scrapper graphics, this one comes out swinging. FINALLY, it’s here! This limited edition sporadical is bigger and badder than before. PERMANENT VACATION ISSUE 2 features new art and writing from 40-something contributors from all around the world responding to the theme of SIMULACRA...fake illnesses, folk-logos, faux glamour, Disneyland disasters, pop politics, spectacles, replicas,­­ fever dreams, alternate realities and other such things. Come to ENJOY GALLERY in WELLINGTON on FRIDAY 24 AUGUST OR come to SAINT OMER in DUNEDIN on THURSDAY 30 AUGUST. The zine will be available for sale along with super secret surprise mystery guest performances. YOU DON’T WANT TO MISS THIS! PERMANENT VACATION 2 will also be available for purchase directly from Kerry Ann Lee or from selected stockists in New Zealand, Australia, Asia, Europe and the US. For further enquiries please contact: kerryannlee@gmail.com. 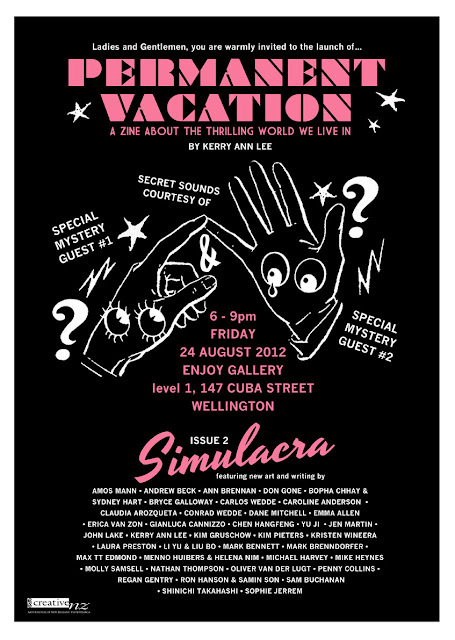 This issue of PERMANENT VACATION is made possible through kind support from Creative New Zealand.